Virgin Media picks TiVo for next-generation HD TV platform | What Hi-Fi? 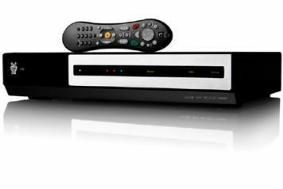 Regular readers may remember that TiVo's set-top box and PVR (personal video recorder) technology was considered groundbreaking at the time, before it was withdrawn from the UK market. Under today's deal, TiVo will develop "a converged television and broadband interactive interface to power Virgin Media's next-generation, high-definition set-top boxes". TiVo customers in the States particularly praise the system's ability to guess which programmes you might like to watch, based on your viewing habits, then automatically record them. Neil Berkett, CEO of Virgin Media, says: "TiVo's proven track record of innovation, the strength of its patented technology and experience in developing best-in-class user environments make it an ideal strategic partner for Virgin Media as we move aggressively to bring our next-generation TV service to market." Berkett is making big promises for the new service, saying it will "allow us to offer consumers the most significantly advanced and compelling TV service available in the UK. "We believe we will do to the TV market what we have done to the high-speed broadband market." Take that, Sky. The first co-branded Virgin Media/TiVo product is expected to become available sometime in 2010.